This 5-day/4-night tour begins with an overnight in Alaska's largest city, Anchorage, The next morning, board luxury rail for your journey to Denali National Park and Preserve. With 2 nights in Denali, you're sure to see the very best Denali has to offer. 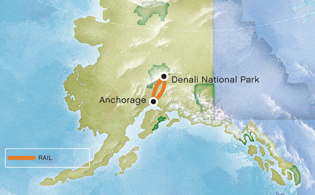 Venture into the park on an optional Denali Park Tour, the Tundra Wilderness Tour, your best chance to view wildlife in Alaska. Or choose an optional excursion like flightseeing, Husky Homestead or an ATV adventure. Enjoy dinner and a show at the Music of Denali Dinner Theater at McKinley Chalet Resort featuring family-style dining and a spirited original musical about the first men to reach the summit of Denali. After your stay in Denali, re-board the train and return to Anchorage for one more overnight in the city. We'll pick you up at the airport and transfer you to your Anchorage hotel. Overnight in this charming city nestled between Cook Inlet and the Chugach Mountains. For your enjoyment, participate in an optional flightseeing tour or an activity spotlighting nearby "must-see" attractions like Portage Glacier. Overnight Anchorage hotel. Enjoy an incomparable sightseeing experience aboard a luxury, domed railcar. Take in the scenery of the Matanuska Valley and colorful towns like Wasilla, billed as the "Home of the Iditarod." Arrive in Denali National Park by afternoon. Here, you can choose from a wide range of optional activities like river rafting, helicopter flightseeing, or a self-drive Jeep tour. Overnight Denali-area hotel. Use your morning to relax or choose an exciting optional heli-hiking, fly-fishing or golfing excursion. Later, re-board the train and journey between the spectacular Alaska and Talkeetna ranges to Anchorage. Overnight Anchorage hotel. Extend your dream Alaska vacation with a variety of exciting Gray Line travel opportunities, or wrap up your tour here. We’ll take you from your hotel to the airport and bid you a fond farewell.